Our moderate rooms (13 sqm) are our most compact rooms, but they contain everything you need for a comfortable stay. 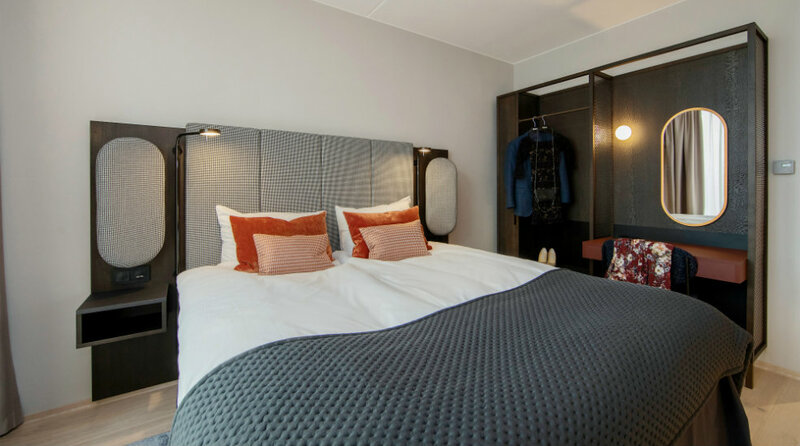 The rooms feature a lovely bed (120cm) with a cosy duvet, a desk, safe, minibar, coffee machine, iron and ironing board, and a TV with media streaming. Each room also has a bathroom with a shower, hairdryer and Rituals toiletries. Our moderate rooms look out onto Dronning Eufemias gate (Queen Eufemia's Street) and the iconic Barcode buildings. The room has a good-sized bed (140cm) with luxury down bedding. Each room has a bathroom with a shower, hairdryer and Rituals toiletries. Facilities include a TV with media streaming, a safe, minibar, coffee machine, iron and ironing board. Our lovely standard double rooms (18 sqm) feature a double bed (160cm) with luxury down bedding. Facilities include a TV with media streaming, a safe, minibar, coffee machine, iron and ironing board. Each room also has a bathroom with a shower, hairdryer and Rituals toiletries. Our standard twin rooms feature two single beds (2x90cm) with luxury down bedding. Facilities include a TV with media streaming, a safe, minibar, coffee machine, iron and ironing board. Each room has a bathroom with a shower, hairdryer and Rituals toiletries. All our standard twin rooms are accessible rooms. Our spacious superior double rooms (approx. 24 sqm) feature a double bed (160cm) with luxury down bedding, a workspace with a desk and chair, an armchair and a large bathroom with a shower, hairdryer and Rituals toiletries. Facilities include a TV with media streaming, coffee machine, safe, minibar and iron and ironing board. Our spacious deluxe double rooms (approx. 30 sqm) feature a double bed (180cm) that can also be made up as two single beds (90cm). Each room has a bathroom with a bath or shower, a hairdryer and Rituals toiletries. Some of the rooms even have a balcony or terrace, and a workspace with a desk, chair and lounge area. Guests can enjoy large pillows for extra comfort, bathrobes, slippers, and coffee and tea-making facilities. An extra bed can be provided if required. Other amenities in the room include a TV with media streaming, an iron and ironing board, a safe and a minibar. Our junior suites are wonderful and spacious corner rooms that look out onto Dronning Eufemias gate (Queen Eufemia's Street). The rooms (approx. 40 sqm) feature a comfortable double bed (2x90cm), as well as large pillows for extra comfort, bathrobes and slippers. All our suites have bathroom with a hairdryer and a bath or shower, as well as a safe and coffee and tea-making facilities. Some of our junior suites can be connected to standard double rooms, and one of our suites features an extra bedroom with a large single bed (120cm). Our stunning penthouse suites (40-50 sqm) boast a private terrace with great views of the city, a comfortable lounge area and a lovely bathroom with everything you might need including bathrobes and slippers.